London: Grant Richards. (1931). First. First edition. Slight foxing, very good or better with minimal wear in very good dustwrapper (illustrated by Arthur Watts) with modest chipping at the crown and some short tears. 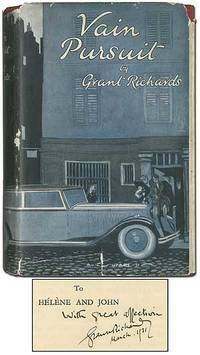 The Dedication Copy, Inscribed by the author to his daughter utilizing the printed dedication: "[printed: To Helene and John] with great affection, Grant Richards, March, 1931" Novel about fashionable folk set in Mayfair, Paris, the Rivera, and New York. Scarce in jacket, unique in the dedication. .